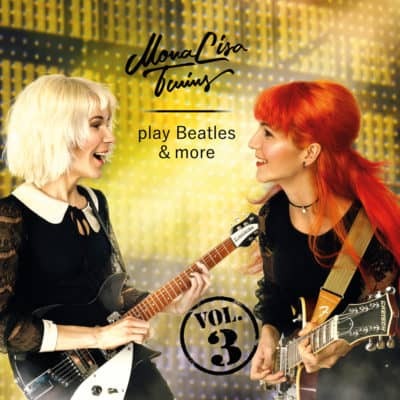 “MonaLisa Twins play Beatles & more Vol. 2” is the second cover compilation album released by the MonaLisa Twins with live & studio recordings of tunes from the Beatles, the Hollies, the Lovin’ Spoonful, the Rolling Stones and more. Check the tabs below for more info, audio clips and lyrics. 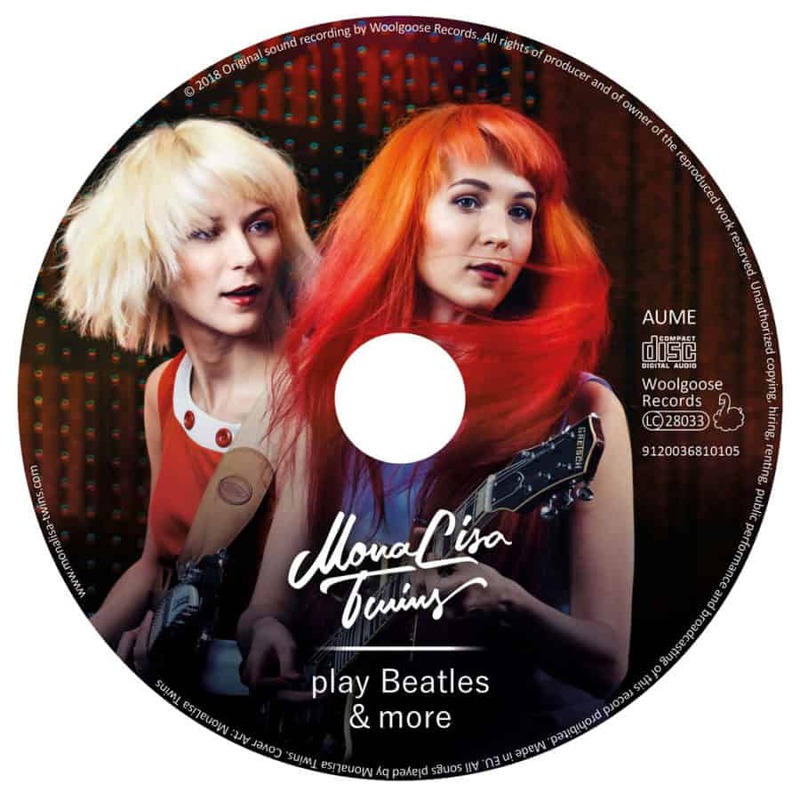 As with all of the covers that the MonaLisa Twins record this collection of songs pay homage to the original tunes while given a touch of the qualities that makes all the music the MLTs perform special. Their harmonies are extraordinary and the musicianship is First Class. Hard to believe sometimes that most of these are recorded in a home studio with all instruments played by the Twins and their father Rudi. Real musicians playing real instruments with vocals by two of the sweetest voices in the world. The CD arrived two days after I had a confirmation email of despatch and I found this great timing. The package, a kind of stiff bubble wrap envelope, was excellent for purpose. On opening the package, I found the CD tightly shrink wrapped. The CD case is of the tough card type with plastic inner holding the CD and a high quality outer and inner print. 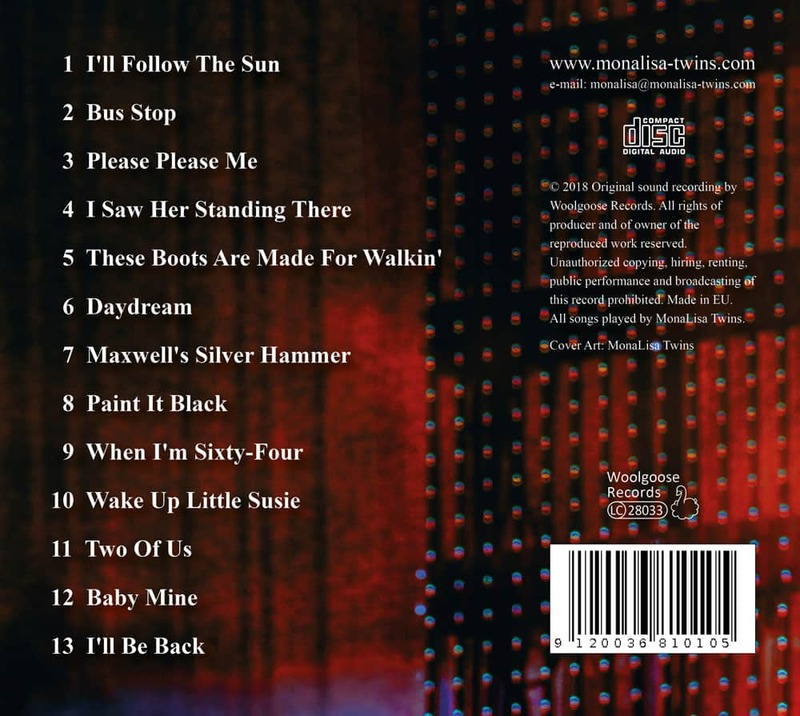 The front cover has a picture of MLT, the rear has a track list and the inner has the track list with notes. Along with the CD, the case has a nice heart shaped card with a picture of MLT and details of the MLT Club. 1; I’ll Follow The Sun – (Studio) The Beatles. Though I’m sure the timing is the same, this MLT version sounds ever so slightly slower and a little more mellow than The Beatles. The vocal harmonies are beautiful, the timing is sublime and the overall sound is a close, friendly, rival of The Beatles. 2; Bus Stop – (Studio) The Hollies. This has all the energy of The Hollies version and MLT are sharp, clear and a little ‘cheeky’ sounding. It would be unfair, in a way, to call this a ‘cover’ as it is so good. The instruments are played with something of an infectious verve! 3; Please Please Me – (Studio) The Beatles. With a slightly haunting intro as with The Beatles recording and a very natural and fluid singing rhythm, this classic is wonderfully rendered by MLT. The girls seem to be having fun singing this one. The harmonies are great as usual and the overall sound, though some may find a little ‘abrupt’ is excellent for the song. 4; I Saw Her Standing There – (Live) The Beatles. Played and sang a little softer than The Beatles, the instrumental work on this is first-rate. The singing is very accomplished with voices exactly complimentary. Being a live recording, this reminded me of when I saw MLT live and (in my mind) transported me back to the venue! 5; Two Of Us – (Studio) The Beatles. Call me an old romantic but I just love this song! Listening to MLT sing this is just so pleasing. I really like The Beatles and I really like MLT. It is difficult for me to pick a favourite version here! I have heard people say they see a little sadness in this song but I always find it uplifting. There is a kind of ease (in a good way) in this MLT version of the song. 6; Daydream – (Studio) The Lovin’ Spoonful. Cheeky, fun, positively gorgeous and simply groovy. Yeah! I like this version. Very well played, the ukulele especially good. MLT really excel on this song. 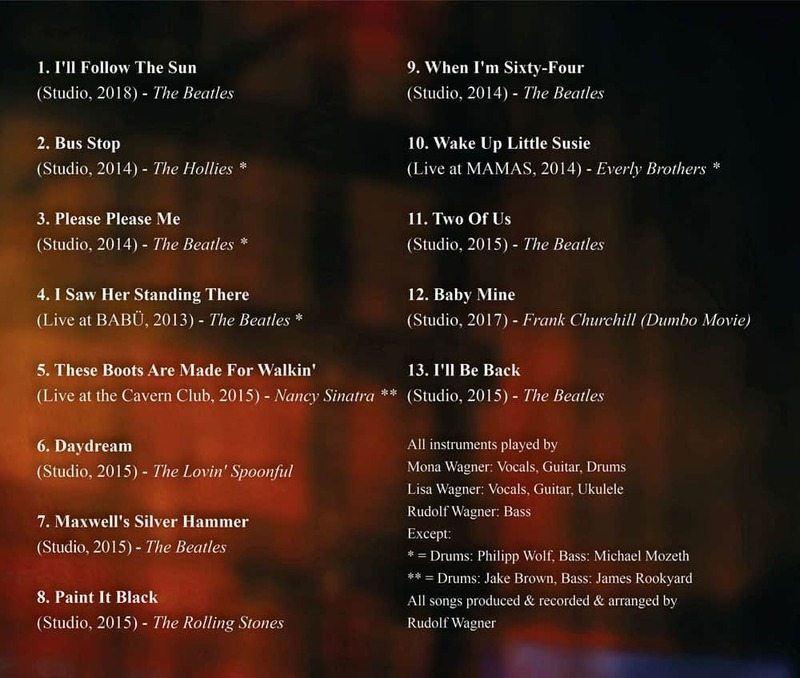 7; Maxwell’s Sliver Hammer – (Studio) The Beatles. 8; Paint It Black – (Studio) The Rolling Stones. The song ‘Paint It Black’ has been described as dark, desolate and morose. These are somewhat fair descriptions as the song relates to a bleakness in depression. How can I pick up this review after those descriptions? The song is covered exceptionally well by MLT. Although the tune is fast and may seem ‘upbeat’ there is a real sense of sadness conveyed in the singing. The music is played flawlessly. A lovely song brilliantly covered. I remember this song being something of a ‘staple’ in music classes at school. Oh … the memories! MLT play this song very well and the singing is fabulous. Mona and Lisa perfectly catch the kind of ‘tongue in cheek’ nostalgia in this song that ought to be present no matter who sings it. 10; Wake Up Little Susie – (Live) The Everly Brothers. As someone that really likes the Everly Brothers, I was quite impressed by this rendering of this song. The instrumental sound of this track is very competent and the signing suits the track wonderfully. 11; These Boots Are Made For Walking – (Cavern Club) Nancy Sinatra. 12; Baby Mine – (Studio) Frank Churchill. This track, name and author, may not look familiar and when you listen to it you may think ‘how do I know this song?’. The track is a very up beat version of the song used in the Disney movie ‘Dumbo’ and is known to some simply as ‘Dumbo Song’. Though it could be argued that the song should be sang slowly, I find this faster version gladdening. There is also a slight changing of the lyrics that brings the song a little closer to modern times but is not overly PC. This is a very competent and enjoyable cover, or re-boot, of a classic that is not to be missed. 13; I’ll Be Back – (Studio) The Beatles. From the start, this song is covered exceptionally well. The vocal harmony of MLT is shown very well herein. The instrument playing and the singing may seem effortless but shows, to me at least, great professionalism. 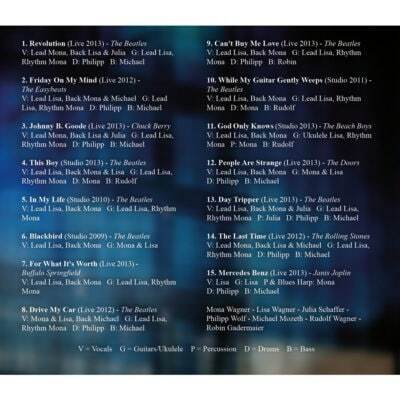 Overall, this second volume of ‘Beatles & more’ is a wonderful showcase of MLT covers spanning from 2012 to 2018. This volume is an essential addition to any MLT fan collection and is recommended to anyone getting started with MLT, interested in quality cover versions or simply looking for good music presented well. *I’d just like to note that when I use ‘cheeky’, I mean it in terms of playfulness or joy. Thanks Tim. I wanted to give a positive, yet fair, review. Glad you liked it. Great review. Loved your track by track insight into each song. 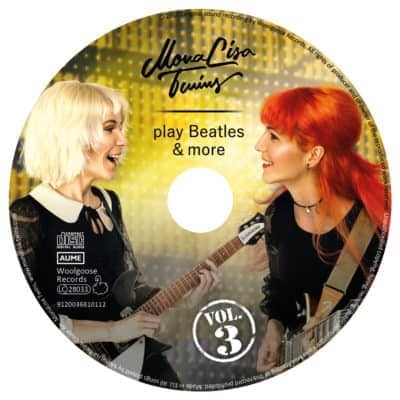 I am a much older guy who remembers the first time I saw the Beatles on tv on the Ed Sullivan Show when I was 14. wow I fell in love with the, since then I have played in bands on weekends and now I have never heard anyone who could harmonize like The Mona Lisa Twins. I use to be hook on Abba but I added The Mona Lisa Twins for sure. Fantastic review. I couldn’t possibly add to it. 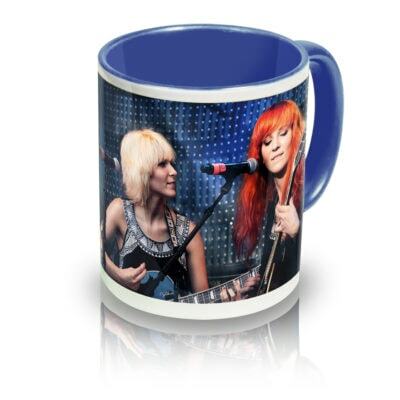 Thanks for taking the time to do this and share it with us. 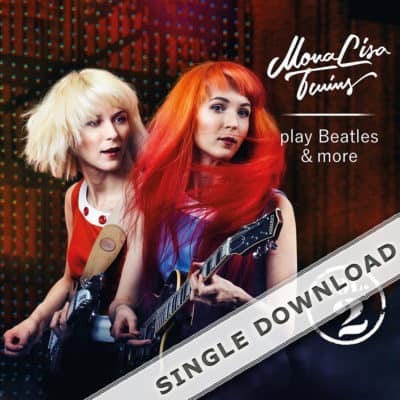 I recently purchased the MonaLisa Twins play Beatles & More 2 & 3 CDs through their web site. And this is my review. 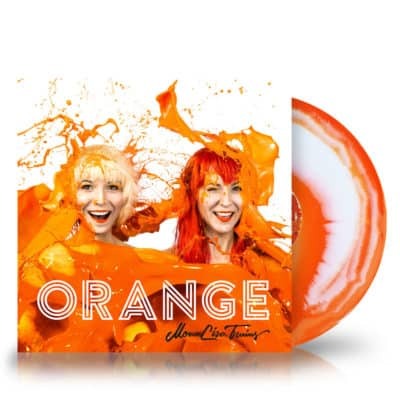 I have all their CDs, DVD of the You Tube videos from the When We’re Together CD as well as their Orange Vinyl Album (haven’t owned a record player/turn table since the 80’s). Dealing with them as a business was a pleasure. All of my purchases through them were seamless and easy. Fast delivery. Their web store ordering system is idiot-proof; rather not say how I know a thing like that. They should succeed just because they are a very good customer oriented family business. All of their studio covers are very good and many of them much better than the originals. Beatles & More Volumes 2/3 have almost all their You Tube covers. They made some truly amazing versions of some of the best-loved songs from the 60’s and a bit beyond. They have powerful yet sweet and inspiring voices and harmonies, really talented and innovative musicians who seem to be having a lot of fun playing music. I missed the fun part of rock and roll for a long time. They gave it back to me. If you like this kind of music you have to support the independent artists who are bringing it to life again. 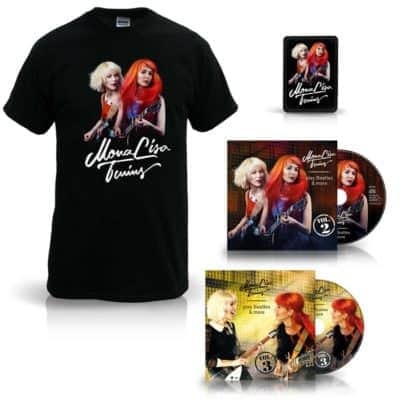 If you want to keep enjoying the MonaLisa Twins music buy their albums/merchandise, follow them and pray for an announcement of their world tour dates in 2019! 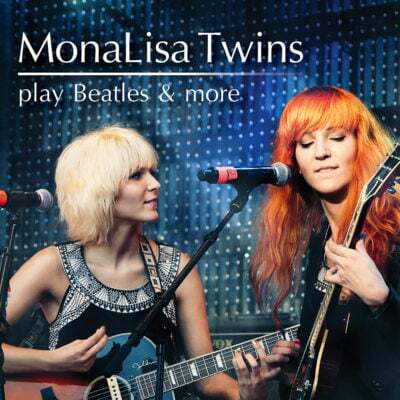 "MonaLisa Twins play Beatles & more Vol. 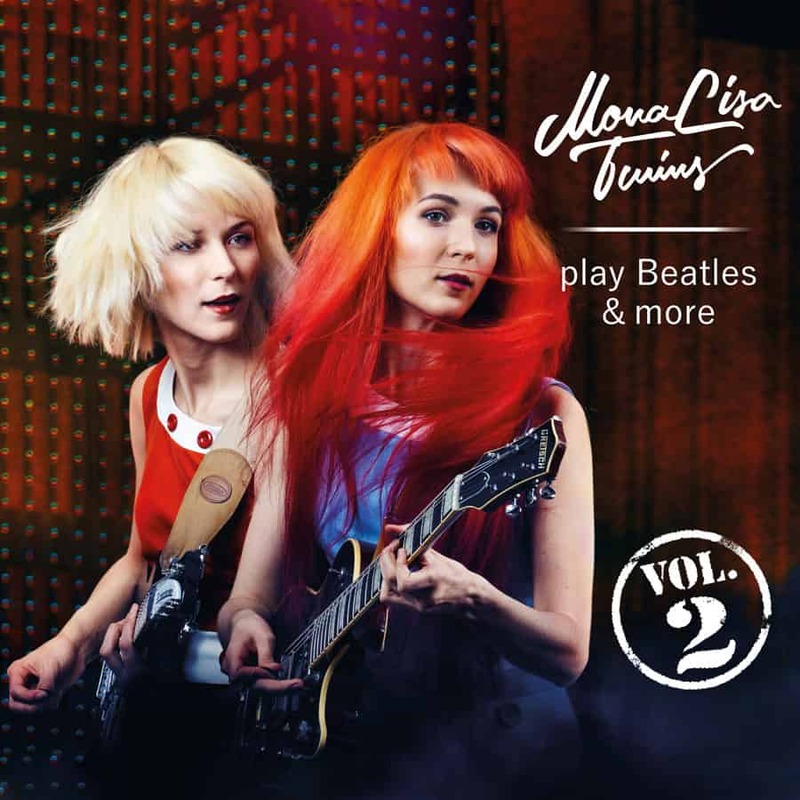 2" is the second cover compilation album released by the MonaLisa Twins. It consists of 13 of their favourite songs from mainly the 60s era, with a lot of Beatles songs but you’ll also find covers of Nancy Sinatra, The Lovin' Spoonful, The Hollies, The Everly Brothers and The Rolling Stones on the album. “After releasing our first cover compilation album back in 2014 we kept recording more and more of our favourite songs from the 60’s. We have focused a lot on our original music too, but the joy of playing around with the songs that made us fall in love with music in the first place never stopped. 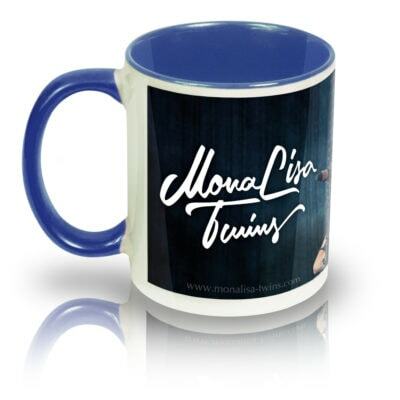 The album features studio recordings as well as a few live performances, like “These Boots Are Made For Walking” by Nancy Sinatra which the Twins recorded during their 2 year residency at the legendary Cavern Club in Liverpool. 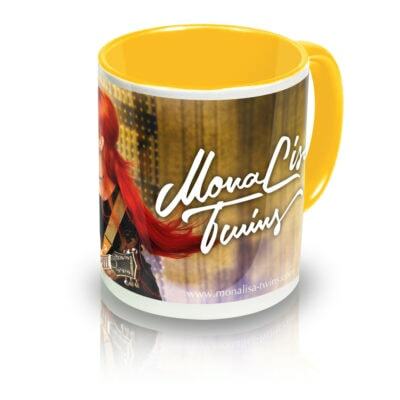 Many tracks on the CD have been on the MonaLisa Twins YouTube channel for years, while others have not been published anywhere before. People from all over the world discovered them by searching for new versions of their favourite songs and then kept following the Twins’ musical career. Maybe you’re one of them! You can also find Vol. 1 and Vol. 3 in the store.